Light-Heavyweight star Dmitry Bivol and the rematch between Jamie McDonnell and Liborio Solis for the WBA World Bantamweight title top the Monte-Carlo Boxing Bonanza – a night of World Championship Boxing in the prestigious Salle Médecin of the Casino de Monte-Carlo on this Saturday live on HBO. Bivol is an exciting 26-year old who will be looking to add another KO to his impressive record. The Russian’s reputation continues to grow and he picked up the crown in just his seventh pro fight. 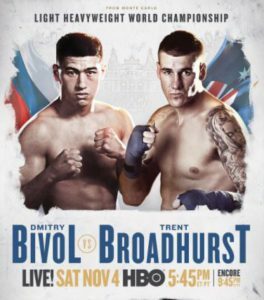 He has already wowed crowds in his homeland and the US and now Bivol will be out to impress in his first fight in front of the Sky Sports cameras. Jamie McDonnell, back from injury, will be aiming to defend his WBA title for the sixth time in a rematch with Liborio Solis, with Dereck Chisora and Scott Quigg also featuring in must-win bouts. Controversial Heavyweight star Dereck Chisora is aiming to become a two-time European champion when he challenges Agit Kabayel for the belt. Chisora landed the title in September 2013 after stopping Edmund Gerber and surrendered it to Tyson Fury, also challenging Kubrat Pulev for the strap in May 2016, and ‘Del Boy’ is looking to take the crown from Kabayel who defends for the first time after winning the strap in February. “We are delighted to be back in Monaco for an incredible evening of world championship boxing live on Sky Sports in the UK and HBO across America,” said promoter Eddie Hearn.